The final weight-loss recipe #5 of 5 using Batch Cooked Ground Beef! So, once you’ve pre-cooked that protein, you have 5 easy recipes to go along with it. Protein Cabbage Wraps, Stroganoff-Stuffed Portobellos, Easy Cheesy Spaghetti Squash, Weight-Loss Italian Soup, and now Korean Beef & Veggie Bowl. I try to base all of these around the idea of “plants + proteins” …and then add in healthy fats and some fruits. Korean Beef & Veggie Bowl is an easy one or two person recipe, and you can increase the heat (or lower it…especially in my case ? to meet your tastes. This is a healthy lunch or dinner idea that can be easily without much fuss. Grate garlic and ginger into a hot pan to provide tons of flavor. 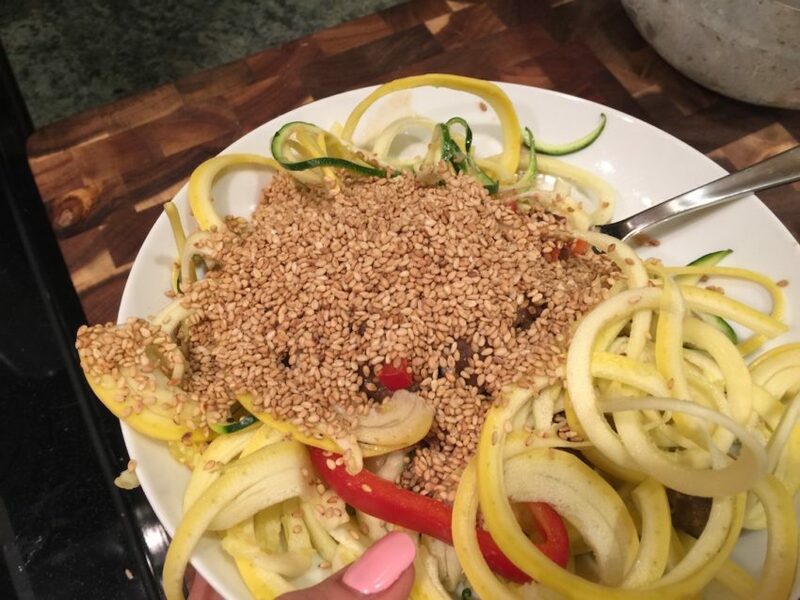 Add tahini (which is simply ground sesame seeds….it’s amazing), and tamari (gluten-free soy sauce) in order to make a sauce. Stir in a little Batch Cooked Ground Beef….and – deliciousness awaits. Top that on a bowl of veggies, or into a lettuce cup. If you need to cook those veggies first, simply sear them in the sauté pan after you’ve cooked the beef. LOLOLOL. Big fail. My beef and veggie bowl turned into a sesame seed bowl. Not exactly as good….but I still ate it! Those sesames are high in calcium, iron, and magnesium. So, my boost of minerals that day was on overkill. Note to self: use the sprinkle side, not the pour side. But I’m certain you won’t make that mistake? 1. Spray a 10 inch sautè pan with nonstick cooking spray and heat over medium high heat. Add garlic and stir for 30 seconds. Add ground beef, ginger, tamari, tahini and red pepper flakes. Stir until heated through and well combined, about 2-3 minutes. 2. Remove from heat. Serve over a bowl of vegetables or veggie noodles. If making veggie noodles, simply sprinkle them with sea salt before putting hot ground beef on top. Sprinkle the top with toasted sesame seeds. Hi Annessa, I just made the Korean Beef and put into Living Lettuce…it was SO easy and SO flavorful! Thank you for sharing your recipes, and for recipes that are “one serving”–as they are difficult to find. Really appreciate it. Made this tonight! It was sooo delicious, I felt healthy and it filled me enough that I didn’t have to overeat. Thank you for the recipe, it had great flavor in every bite. That’s awesome Maria!!!! I love that my recipe made it to your kitchen. I like the idea of these recipes but wondering if I can’t use low-sodium soy (since I have that) and are you a big proponent of ‘gluten free’? Also, you know I posted on FB that my work friend and I had been discussing the spiralizing of veggies, my hang up is do you serve them raw or do you always sauté them or roast them first? Donna, excellent questions! Yes, use low-sodium soy sauce. Also – about being gluten-free: I am not a 100% gluten-free eater personally; It just so happens many of my recipes are gluten-free because I don’t often use processed ingredients. I still use pasta occasionally for my kids and such. However, many people I know of have been experiencing lower inflammation and more energy by eating gluten free, so I like to support that as much as possible. I have other friends that find that not eating gluten helps mental issues, like depression & anxiety. I say, if it works for you, GREAT. Please don’t feel like you *have* to find tamari (gluten-free soy sauce). As for the spiraled veggies: it depends on the veggie, but in most cases, they can just be sautéed lightly and quickly on medium high. If it’s a tender veggie like zucchini or yellow squash, it doesn’t need to be heated at all….just a sprinkle sea salt. The salt makes it more tender by drawing the water out of the zucchini. It also makes it more flavorful! If you wanted to heat those, just give them a quick immersion into boiling water, or a quick saute in a pan. I hope that helps!